Summer seems to have arrived early here in Ohio, and it’s time for another Tuesday Stretch with the BugDoc! Three weeks ago, I began my discussion of stretch glass cheese and cracker sets by covering those made by Fenton, Northwood and Diamond. This time, I’d like to finish out the remaining companies that made these sets – Imperial, Lancaster and U.S. Glass. Imperial made two different sets that belong to two lines. The #461 set is very similar to the Northwood set but the plate has a very different holder ring and the cheese dish has fairly straight sides and distinctive rings at the top and bottom of the stem. Notice that the plate ring is gradually built from the edge of the rim. It doesn’t look like a definite ring in a circle. What is interesting is that the plates often come with an impressed starburst in the base or plain. Those with the starburst can be confused with the Diamond plates, but the Diamond plates have a distinct ring to retain the cheese dish. Imperial’s #461 comes in Iris Ice (crystal), Blue Ice (smoke) and Rose Ice (marigold). Here is a Blue Ice set with the starburst in the base. 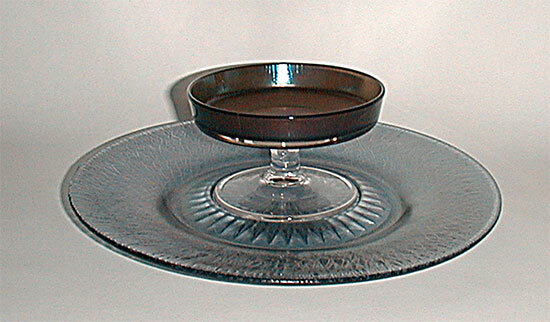 Notice that only the inside of the cheese dish is iridized. Many of the #461 sets can also have cutting through the iridescence. It proper cheese dish for these sets will have a leaf-band cutting also. Here is a correct set in Iris Ice. Lancaster also made a fair number of cheese and cracker sets (#88) and almost all are marigold (probably their Aztec and Rose Ice). A few are also known in Iris Ice. The plates always have a well defined retaining ring and the cheese dish has no rings where the stem joins the top dish and foot. The cheese dish tops are also gently rounded. Here is a fine example of the #88 cheese and cracker set in what appears to be Rose Ice. To make things a bit confusing with Lancaster, there are additional sets that use a small, 8-inch diameter plate with only a depression in the middle, not a ring. I don’t know if these are actually cheese and cracker sets or something else (perhaps another serving set). This is one of these sets in Iris Ice and it is an obvious set because of the matching decoration! 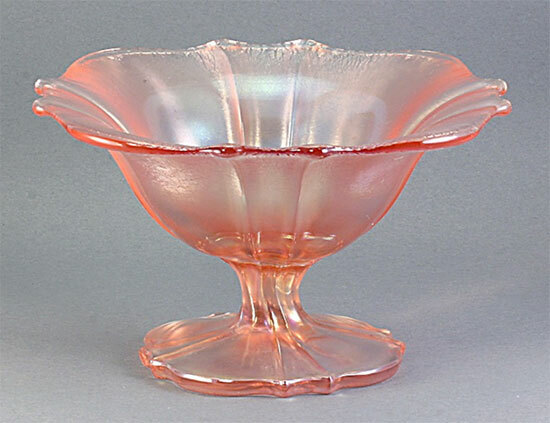 I’ve saved U.S. Glass to the last because they made two types of cheese and cracker sets and I have yet to photograph a complete #320 set in stretch glass (I have it in their red satin glass). The plate is ground and looks a lot like the Northwood plate. 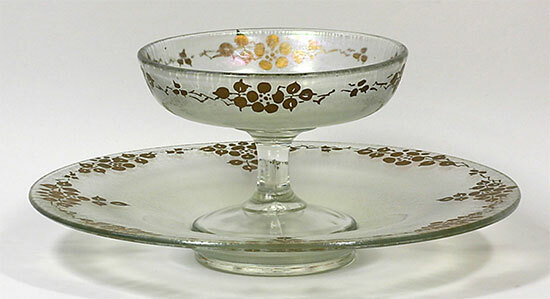 The cheese dish also is very similar to the Northwood set by having a ring where the dish meets the stem, but no ring where the stem meets the foot. I have an image of the plate, but I discovered that the cheese dish is Imperial’s, so I’m including my red satin example. This appears to be tough set to obtain and I suspect that I’ve missed it because of the similarities to the Northwood set! The easiest U.S. Glass set to identify (and much easier to find) is the #310 sets. These have distinctive pairs of rays and scalloped edges to both the plate and dish. I’ve only seen these sets in green and pink stretch, but I wouldn’t be surprised if one shows up in topaz, blue or crystal as other #310 pieces come in these colors. Notice that the cheese dish has a round foot, not scalloped. I mention this because there is a small mayonnaise dish that can fit in the ring, but the mayonnaise foot is scalloped. Here is an example of the #310 mayonnaise with the scalloped foot.